We are very excited to announce that Native Instruments has released REAKTOR 6! REAKTOR 6 has many improvements that we're extremely excited about here at Twisted Tools as developers of REAKTOR ensembles. There have been many changes, fixes and improvements made to REAKTOR that will directly affect the quality of the instruments Twisted Tools will be building in the future. We've been working closely with Native Instruments to ensure that our instruments are compatible with REAKTOR 6 and are happy to announce that all our instruments are working properly. We are excited about the future of REAKTOR and have put together a list of some of the most significant changes for developers below. Before, there were two types of Core Cells (Audio and Event). It was a major headache to build big and efficient Core structures. Now it's much easier as there is no more distinction between event and audio Core Cells and you can do big blocks of processing inside of one Core structure. In addition to that, the maximum number of input and output ports for Core Cells have been increased from 40 to 256! Bundles allow you to combine multiple wires into one wire and then unpack into the individual wires later on. This will allow you to make your structures much easier to read and debug. 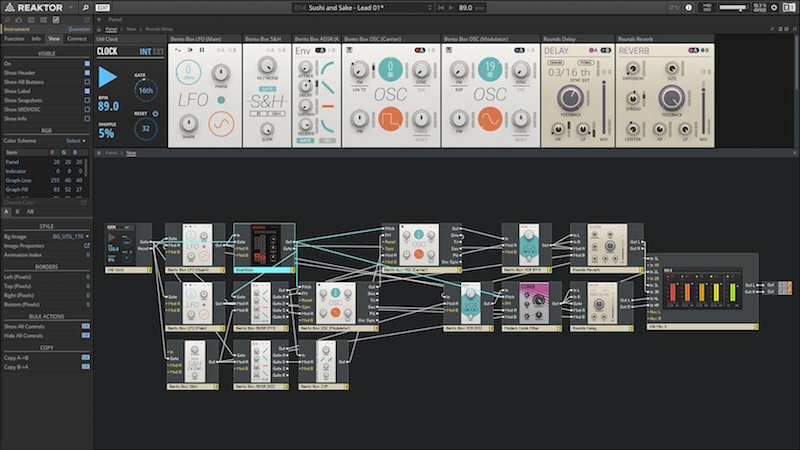 In addition to Quick Buses, which allow local wireless connections inside one macro, REAKTOR 6 provides a new feature called Scoped Buses. Scoped Buses allow you to create wireless connections between several structure layers. Scoped Buses can also send Bundles between different parts of the structure. This new feature allows you to create very compact and clean structures all of which will lead to more efficient and readable code. Nearly all the Core macros have been completely re-written and optimized for sound quality and CPU efficiency. This means now it’s possible to build even better sounding effects and instruments in Reaktor. The Table Framework enables you to build new kinds of creative samplers by allowing flexible and efficient sharing of data within a structure. Now it's possible to dump your WAV file data directly and instantly into a REAKTOR Core Cell, which allows for a much more advanced way of processing and reading data. You can now build your own custom creative samplers from scratch, that are highly optimized and support drag & drop from the browser. Moreover, references to the audio samples you use can be stored on a per-preset basis so you are no longer bound to a sample map with 128 sounds! - The new primary library modules have now been written using the latest high-quality Reaktor Core DSP. This means better quality Primary Modules that are easy to use and study for your own instruments and effects. The library also includes a number of new various debug and utility macros. - Several color schemes for your structure. - In-Place editing. Double-click on a macro name or constant for instant editing without going into the Properties. - Snap-to-grid! This is a massive time-saver. Now you can move panel objects around on a pixel level basis, instead of a 4x4 pixel grid. - Mouse Area drag&drop support to load Wave files directly onto your instrument's interface, to use with your custom Samplers. - Freely resize Reaktor 6 plugin window. - Improved system to save a local copy of the ensemble with your host project. - Reaktor 6 now offers standardized 'Blocks', which allow for easy modular-style patching in Reaktor. - Over 30 high quality DSP Blocks are included in Reaktor 6.